2 Series - Plunger pumps with operating pressure up to 750 bar. 3 Series - Plunger pumps with operating pressure up to 250 bar and flow rate up to 402 l/min. ARP Series - Plunger pumps for abrasive-containing water. Operating pressures up to 400 bar. Y-Series - Plunger pumps with operating pressure up to 1000 bar. Z-Series - Plunger pumps with operating pressure up to 1500 bar and flow rate up to 600 l/min. M-Series - Plunger pumps with operating pressure up to 3000 bar and flow rate up to 185 l/min. 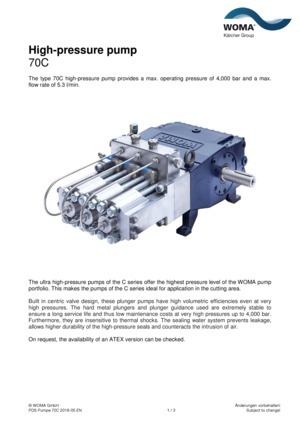 C-Series - The ultra high-pressure pumps of the C series offer the highest pressure level of the WOMA pump portfolio. This makes the pumps of the C series ideal for application in the cutting area. Built in centric valve design, these plunger pumps have high volumetric efficiencies even at very high pressures. The hard metal plungers and plunger guidance used are extremely stable to ensure a long service life and thus low maintenance costs at very high pressures up to 4,000 bar. Furthermore, they are insensitive to thermal shocks. The sealing water system prevents leakage, allows higher durability of the high-pressure seals and counteracts the intrusion of air.